LANGRIA's rolling computer desk is designed with a simple yet functional conception and high-quality materials for a satisfactory work experience for right-handed and left-handed users. The table top is made of 2-split eco-friendly Formaldehyde class E1 MDF wood board panels of 15 mm thickness with a grain texture. The firm metal base effortlessly holds up to 22 lbs. (10 kg) of evenly distributed weight. Finally, the black walnut coating ensures an easy fit for the table with most home or work furnishings. Adapt the laptop desk to your needs. Both height and table angle, are adjustable and simple to set up. Choose your preferred height from 23.5 inches (60 cm) to 35.5 inches (90 cm) and the tilting position for both tables. The panels can be individually tilted up to 180° using the table knobs, moreover, the smaller panel can be lowered to swivel 360° for extra convenience. This stylish desk cart in black walnut color measures 23.5 x 16 x 23.5-35.5 inches (60 x 40 x 60-90 cm) and it can be used in many different scenarios. 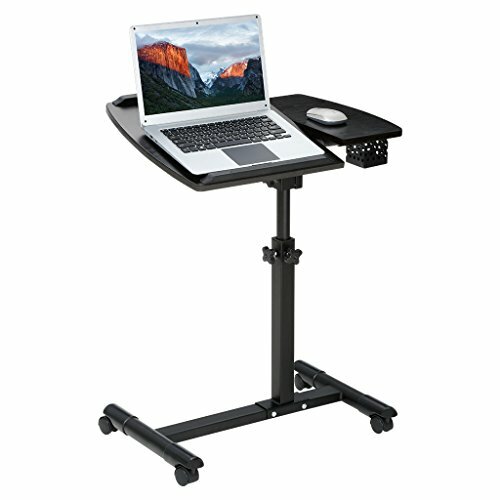 It is the perfect as a standing desk or a sit-stand one to work with your laptop, to write, read, work, study, watch TV, and as a side cart to present project presentations at work. To add some extra storage space, side basket next to the smaller panel handily stores your stationary, pens and other small items. If you have any questions about this product by LANGRIA, contact us by completing and submitting the form below. If you are looking for a specif part number, please include it with your message.